I’m sure it’s very easy to have some fun on the bayou. But son of a gun, I do not live close to a bayou. 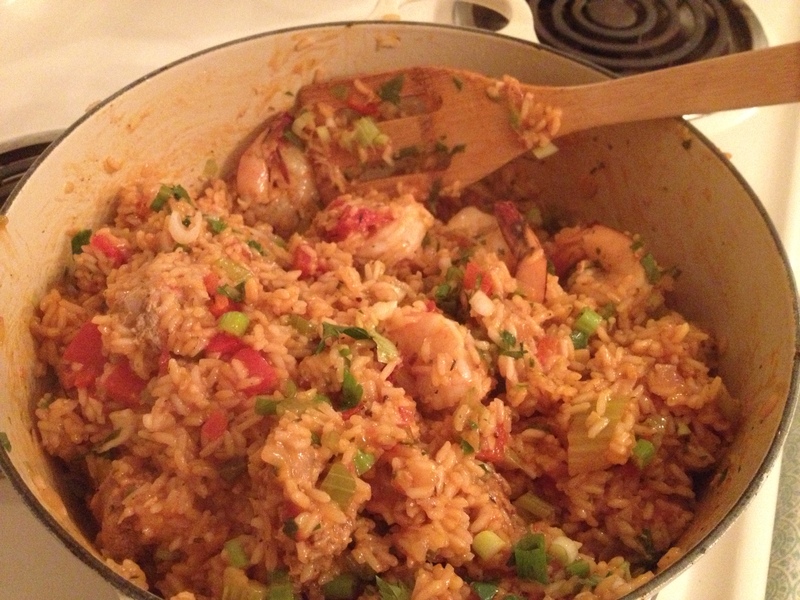 So I brought the bayou to me by making jambalaya! The name alone sounds like a party. This hearty one-pot meal is surprisingly simple. I wasn’t so sure at first. But my Louisianan friend Leigh Ann assured me: “All you have to do is get the trinity right. After that, it’s just a little bit of this and a little bit of that!” Below is the beginning of the Cajun holy trinity that Leigh Ann was talking about. This is just equal quantities of onion, celery, and bell peppers. 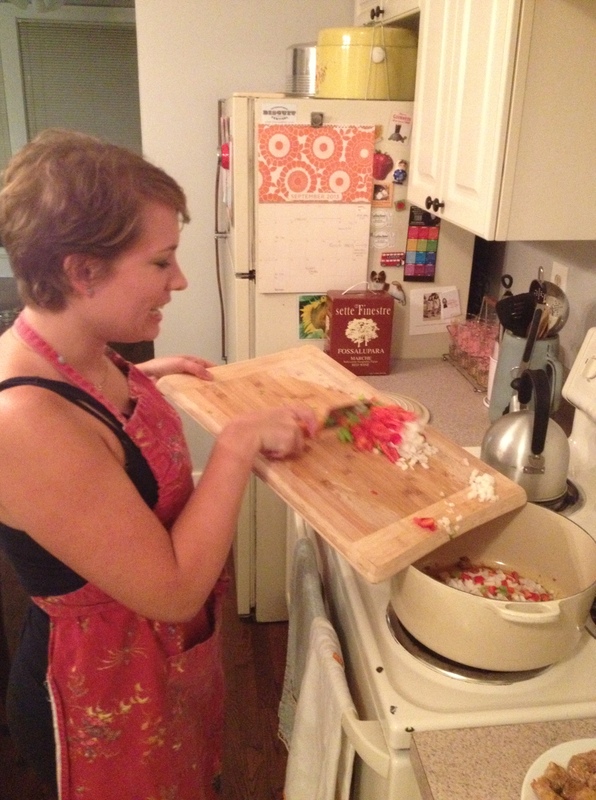 A mirepoix variant, if you will. And I will. I took Leigh Ann’s words to heart. 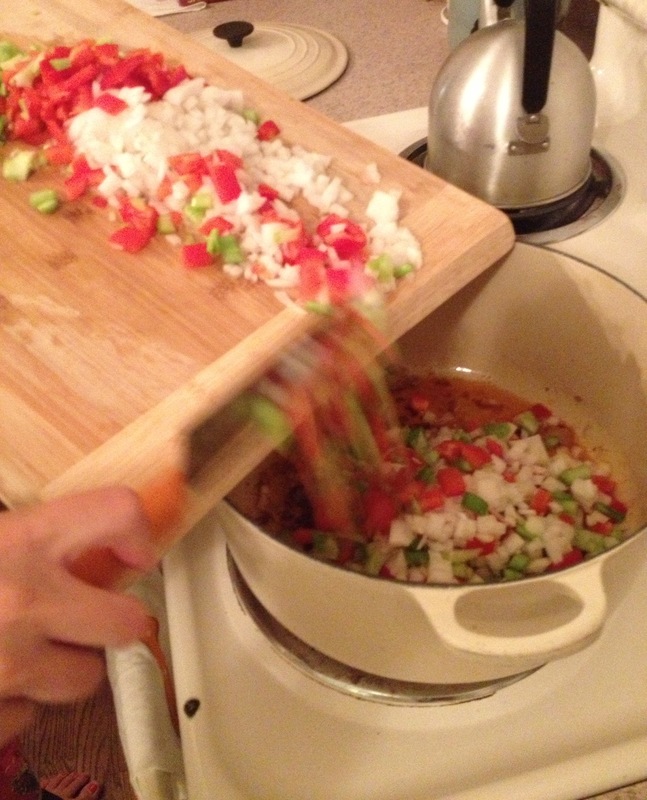 Ina’s original recipe calls for chicken thighs, but I am not a chicken lover, so I left those out. You should leave them in if you’re into that sorta thing. 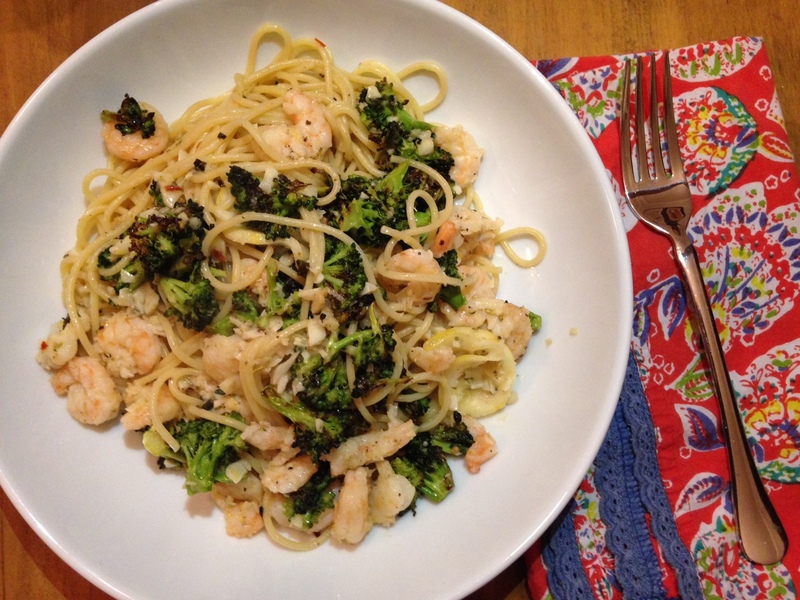 Whatever you decide, make this dish the next time you have a crowd coming over. No matter how many people show up, I bet you will have leftovers. Heat the olive oil in a very large Dutch oven or stockpot, add the sausage, and cook over medium heat for 8 to 10 minutes, turning until browned. Remove the sausage to a plate and sliced diagonally ½ inch thick. Set aside. Add the butter to the pot of browned goodness, then add the onions, bell peppers, celery, 1 tablespoon salt, and 1 teaspoon black pepper. Cook over medium to medium-high heat for 10 minutes, until the onions are translucent. Add the tomatoes, jalapeño, garlic, tomato paste, oregano, thyme, cayenne, and 1 teaspoon salt, and cook for another 2 minutes. Add the white wine and scrape up the browned bits in the pot. Add the stock, rice, sausage, and bay leaves and bring to a boil. Cover the pot, reduce the heat to low, and simmer for 20 minutes. Stir in the shrimp and simmer, covered, for 5 more minutes. Remove from heat. Stir in the parsley, scallions, and lemon juice. 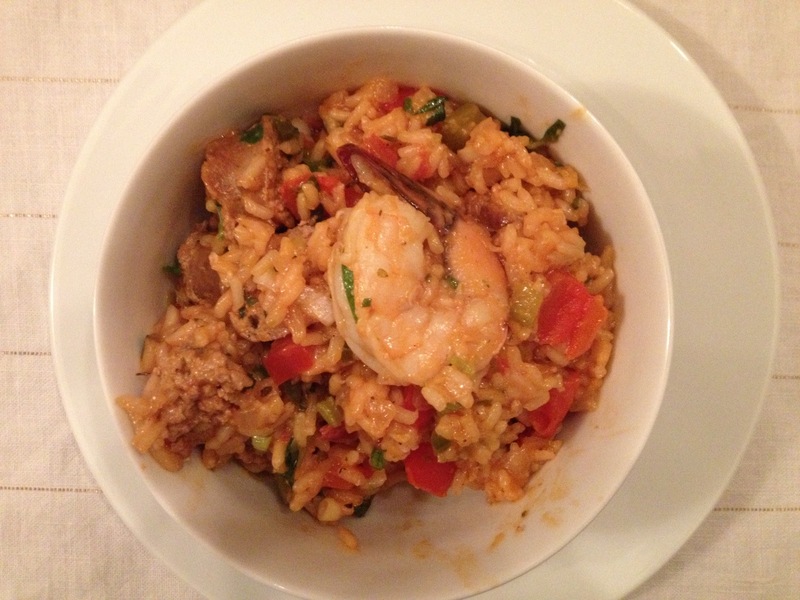 Cover and allow to steam for 10 to 15 minutes, until the rice is tender and the shrimp are fully cooked. Discard the bay leaves. Garnish each serving with a sprinkle of parsley and scallions. 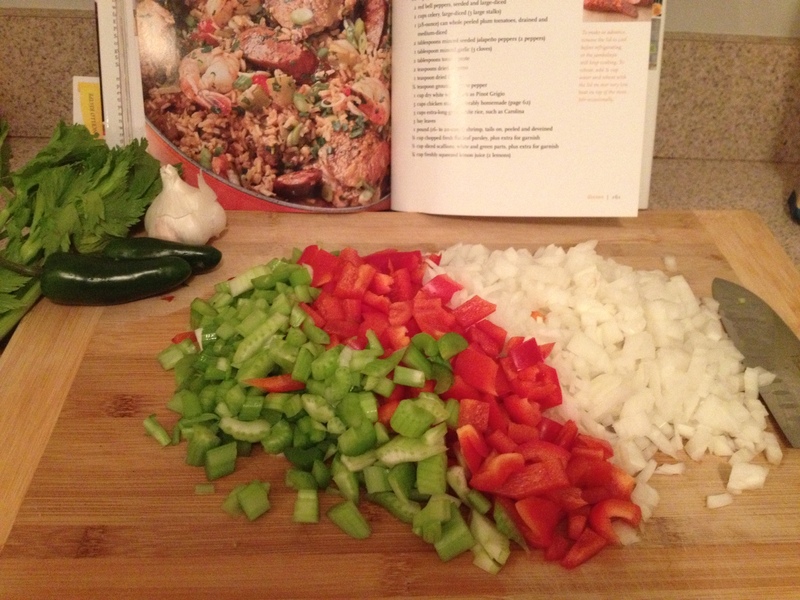 Categories: Recipes | Tags: cajun, holy trinity, ina garten, jambalaya, mirepoix, shrimp | Permalink.